Pop star turned entrepreneur Jessica Simpson, was spotted leaving the Bowery Hotel in New York City on Thursday (August 10). 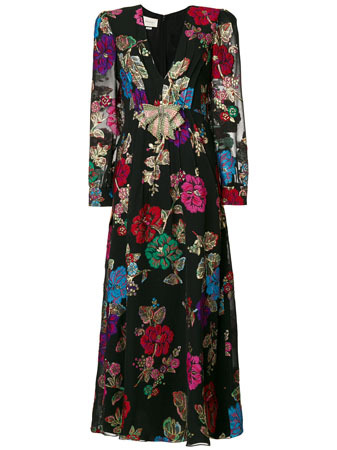 Despite it being mid-summer, she is already reaching for her autumn closet wearing a Gucci Pre-Fall 2017 floral maxi dress. Season aside, it feels very extravagant for a day time look, especially when you consider the rhinestone detailing. Vintage-style shades, strappy sandals and a Dolce & Gabbana ‘Sicily’ bag completed her summer in the city look. You may remember that Datoka Johnson wore this same dress during awards season.